Finally! I posted the first oneshot in this collection four and a half years ago, and now it's completed! Summary: In "He Won't Love Me", everyone knows Yasuda has a crush on Honda Yuka, AKA Yuka-chan-senpai, but that doesn't deter Akira from confessing her feelings to him. But when he agrees to go out with her, she finds it's harder than she thought to be with someone who has feelings for someone else. While Kidu and I are still figuring out what we want to do next, I'm happy to announce a new collaborator, NightSwan of HotCakes. 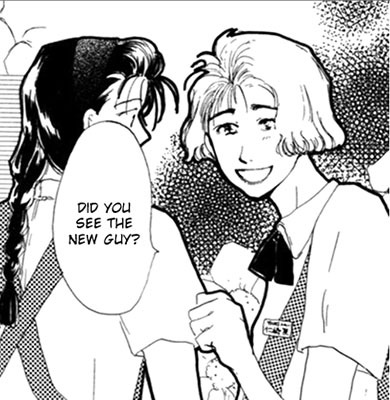 I'm going to be doing some translation work for them (I'll make an announcement here when it's posted) and they're doing some cleaning and typesetting for me! I only have half of the next story in the collection translated (and there's a third I haven't even started on) and it's pretty low priority, but since these are one-shots, it's not like you'll be left with a cliff-hanger if it takes a while to get them out. 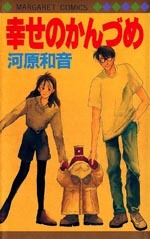 But anyway, if you like Kawahara Kazune or just want to check out some older shoujo (I just looked at the publication date and this is over 20 years old! Wow, I don't remember it being that long ago… XD), please take a look! Summary: Painfully shy Chiaki is devastated when she doesn't recognize any names on the roster of her new class, but the boy she's sat next to, Goto, is so outgoing and funny, they soon become good friends. Little by little, Chiaki begins to come out of her shell, but will it be enough when she realizes her feelings go beyond friendship…? As some of you may remember, several years ago I was working on a collaboration with Occasional Amateur Scanlations to put out some old Kawahara Kazune one-shots. I had the translations done a long time ago, but life interfered and they never got beyond the script stage. But today I got a suprise email from Occasional Amateur Scanlations saying the final story in A Can of Happiness was completed! 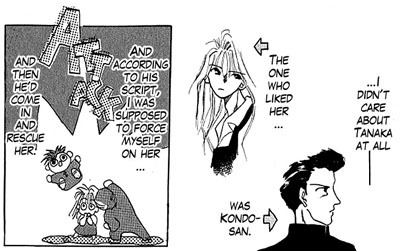 Summary: Kawamura and Tanaka are going out now, although Kawamura thinks Tanaka is a bit scary, and it's actually Kondo-sempai who likes Tanaka. What went wrong? 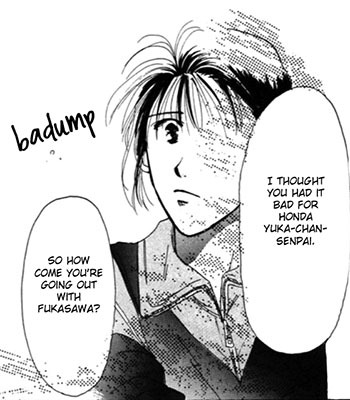 And why did Tanaka agree to go out with Kawamura in the first place? 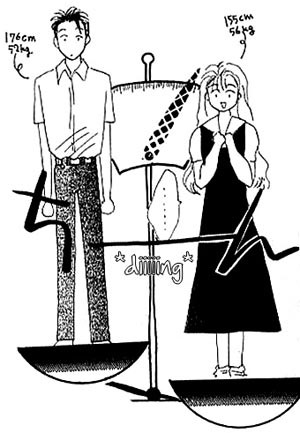 The proud tsundere Matsuda has been in love with happy-go-lucky Tsumura for ages, but she just can't tell him. Aggressiveness is her heart's only defence when she's near him – after all: "The Opposite of Love is Hate". 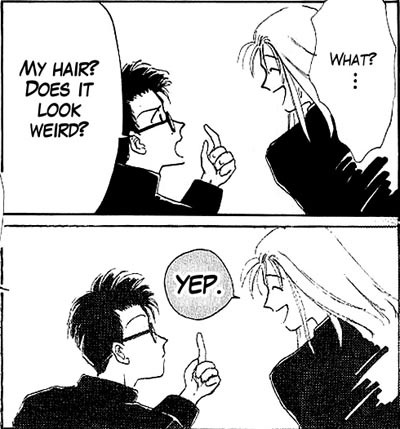 Tsumura has never minded before, so what will happen when that changes? This is the fourth story in Kawahara Kazune's anthology "A Can of Happiness" and is another collaboration with Occasional Amateur Scanlations. 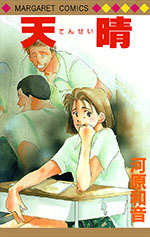 High jumper Kito is one year older than her boyfriend Kawai – a fact that his classmates seem not to approve of. 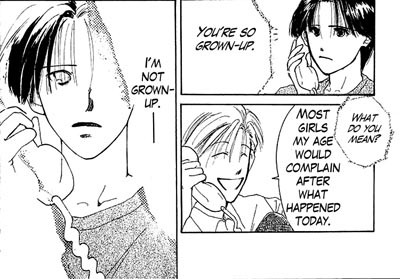 She feels pressured to live up to the image of being grown-up, so that Kawai won't be disillusioned. This relationship is bound to end in tears – or is it? This is the third story in Kawahara Kazune's anthology "A Can of Happiness" and is another collaboration with Occasional Amateur Scanlations. 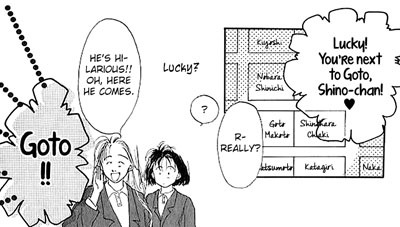 Because of the annual health day at school, Shinako finds out that she's 4 kg heavier than her crush, Nagase. How will she handle this and what will happen if Nagase ever finds out? Is it true that "Boys Just Don't Understand"? This is the second story in Kawahara Kazune's anthology "A Can of Happiness" and is another collaboration with Occasional Amateur Scanlations. Happy Valentine's Day & Happy Lunar New Year to those who celebrate! 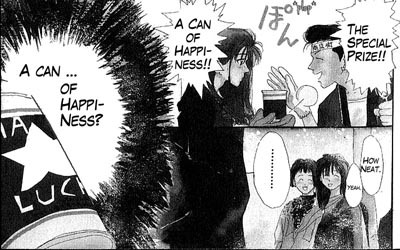 Emi wins the special prize in a raffle, which turns out to be a can that supposedly holds happiness. There's even a weird little man who starts following her around, claiming he's the "god of the can" and trying to give her advice. But all she wants is for her relationship with her boyfriend to feel less like a one-sided crush. Will this can really help her be happy? I've been working with Occasional Amateur Scanlations to translate some older anthologies by Kawahara Kazune (author of Sensei! and High School Debut). This is the first story in an anthology by the same name. The other four stories in the anthology will follow whenever we get them done.